We rang in the New Year and now it’s time to let that slow-cooker do some of the heavy lifting for awhile! You’re going to love this collection of Vegan Slow Cooker recipes I’ve put together, regardless if you’re vegan or not! I’ve got 17 Vegan Slow Cooker Recipes that are low maintenance and guaranteed to help you start afresh this year! So raise your hand if you have a slow-cooker. Yeah, me too! I have 2 actually. You guys, we’re talking hardly any work here! Soups, stews, oatmeal, applesauce and VEGAN! That’s right! No meat products in these recipes! Between Christmas Eve and New Year Day, I let go of all the rules and eat whatever I want. It’s such a joyous time in my life to eat whatever I want and yes, I fully enjoy the splurge! But, when New Year’s Day hits, it’s back to clean eating. And, I’m a bit lazy at the beginning of the year. So yes, I appreciate a little help from my slow cooker and my Instant Pot because let’s be honest, I pretty much took 2 weeks off from cooking and it takes me a minute to get back into the swing of thing. Queue the slow cooker! I have a lot of vegan friends and I often get asked if I have a lot of vegan recipes on my food blog and you know what, I don’t! So I decided to keep giving the universal gift of food by sharing 17 of my favorite Slow Cooker Vegan Recipes! Clean eating…this is the PERFECT recipe if you’re looking for an easy and super clean meal to eat. And since this lentil stew with butternut squash is made in the slow cooker, it doesn’t require a lot of work! 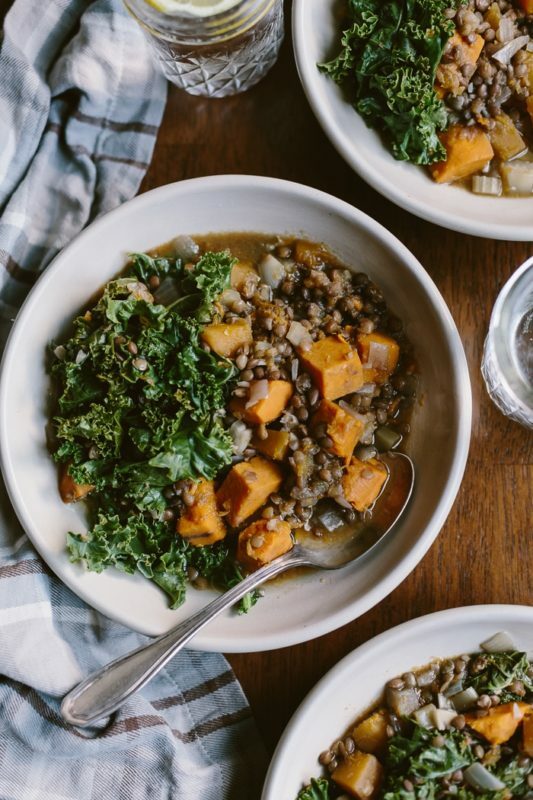 Butternut squash, lentils, kale, celery, sweet potatoes and carrots…YUM! Check this one out from Foolproof Living! Beyond The Chicken Coop describes this one perfectly…”Refried beans made in a crock pot. Lots of flavor and no fat!” I know it says “refried” but trust me, this recipe is super clean and healthy! 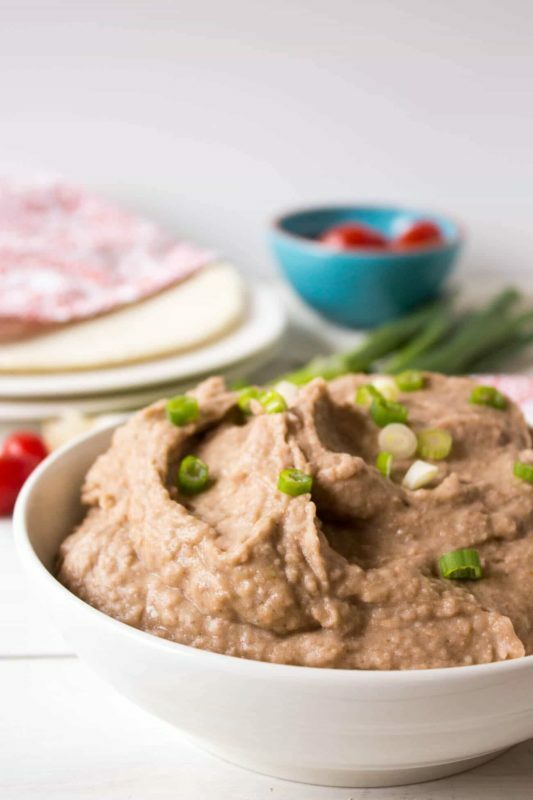 And, it’s a big time saver by making these refried beans in the slow cooker! Dried pinto beans, onion, garlic with the option to spice it up with Jalapenos…tasty my friends, TASTY! Did you know you can make rice in the slow-cooker? I didn’t ….until I ran into this recipe from A Clean Bake. I know the Instant Pot is crazy popular right now and let me tell you, it makes some great rice, like my Instant Pot Mexican Rice recipe, but let’s not discredit the slow cooker. 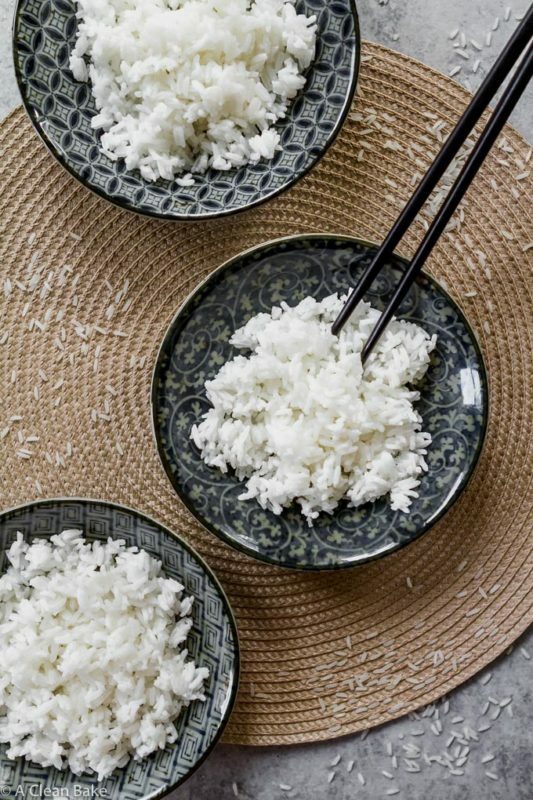 This recipe calls for 3 simple and clean ingredients you have in your house…rice, water and salt. Skip the pot on the stove method and put that slow cooker to work! These Slow Cooker Mushrooms are vegan, gluten free, vegetarian and super versatile! 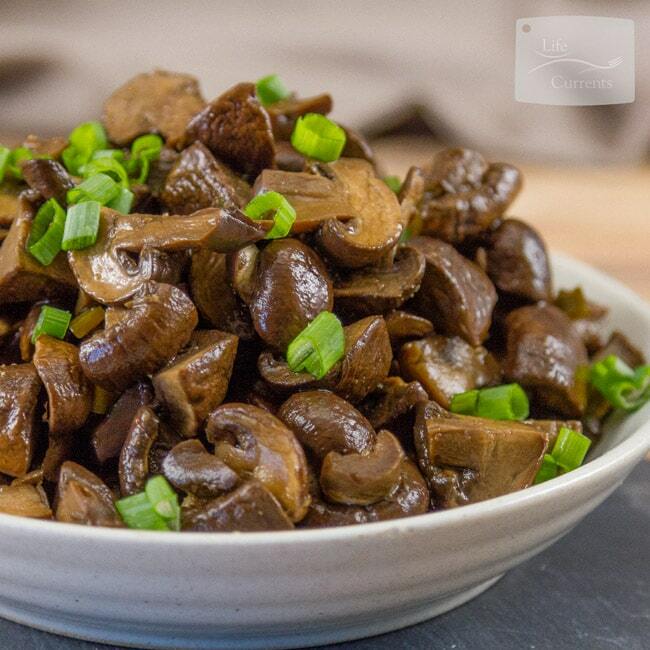 Life Currents gives you some AMAZING options for these Slow Cooker Mushrooms. …and due to the versatility, this recipe is worthy of 2 pictures! Taco Tuesday, anyone? What a perfect vegan and vegetarian weeknight dinner! Who’s ready for breakfast?! 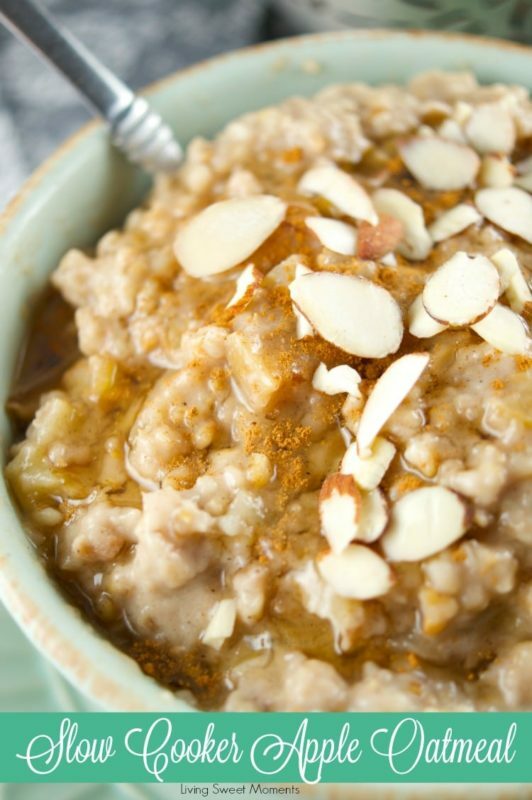 I love steel cut oats and if you’ve never made them in a slow cooker, you’re missing out! Check out this Slow Cooker Apple Oatmeal recipe from Living Sweet Moments. This is clean eating at it’s finest! Who doesn’t love a good tortilla soup! 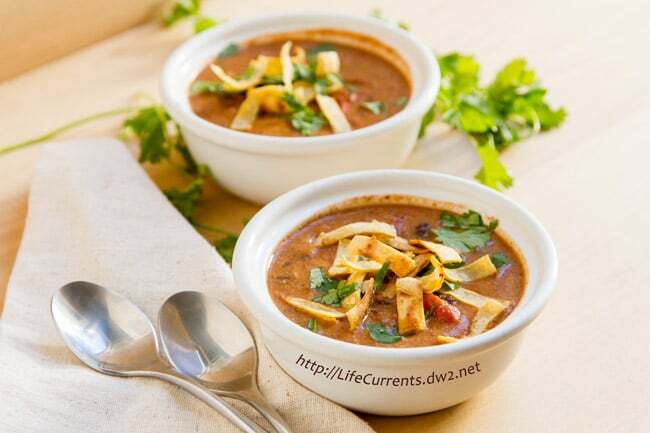 Toss that chicken out and enjoy a clean tortilla soup that’s filled with veggies! This one contains pinto beans, black beans, red peppers and salsa! 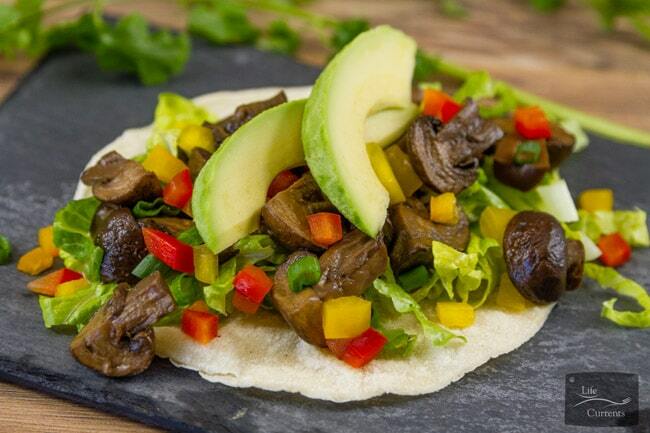 Top this one off with fresh corn tortilla strips, cilantro and avocado and you’ve got yourself an amazing meal! This one comes to you from Life Currents. This is vegetable heaven! 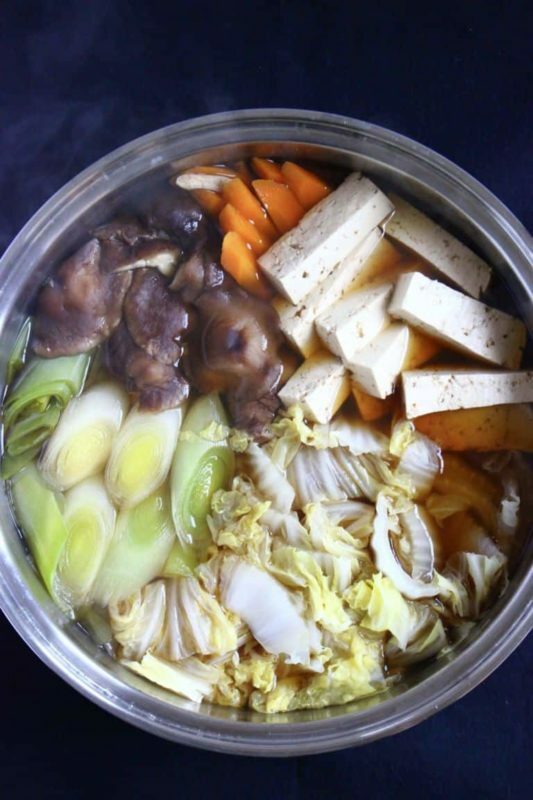 You’ve got leeks, Chinese cabbage, Shiitake Mushrooms, carrots and tofu! Serve this one on top of rice or rice noodles and you’ve got a fabulous tasting lunch, dinner or snack! Shout out goes to Rhian’s Recipes on this fabulous vegan slow cooker meal! We’re looking at apple juice, pineapple juice, fresh oranges, and cranberries are spiced with cinnamon, ginger, and nutmeg and simmered together in the slow cooker. Sounds AMAZING, huh? Missing Christmas? 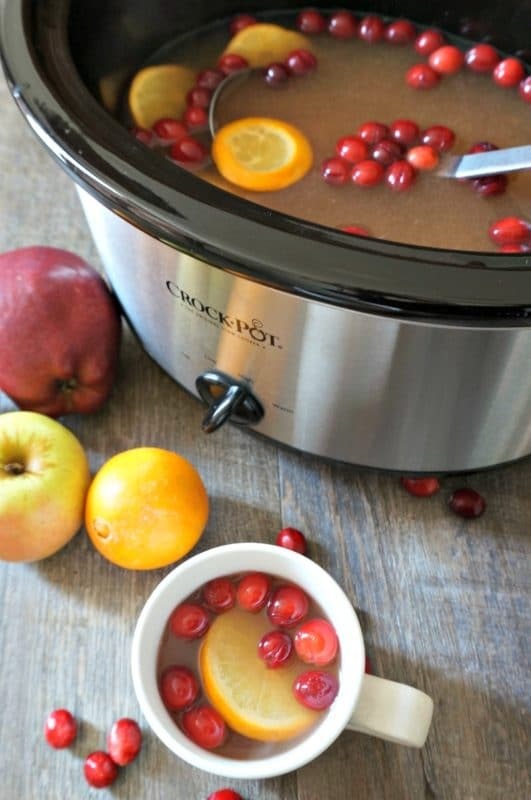 Make a batch of this Slow Cooker Mulled Cranberry Apple Cider and it will take you back! This yumminess comes from A Mind Full Mom. So, what is Harissa? I’m glad you asked! Harissa is blend of hot chili peppers, garlic, olive oil and spices…like cumin, coriander, caraway and mint. 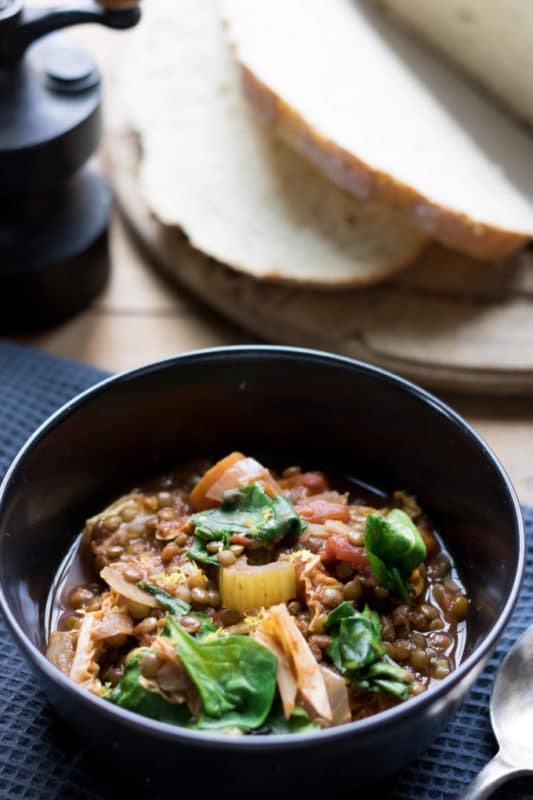 This Slow Cooker Lentil Stew with Harissa is vegan, gluten free and super hearty and busting with vegetables and flavor from the Harissa! This one comes from Veggie Desserts! We are in the cold weather season so I’m giving you PLENTY of food choices to keep you and your family warm this year! Looks delish doesn’t it? 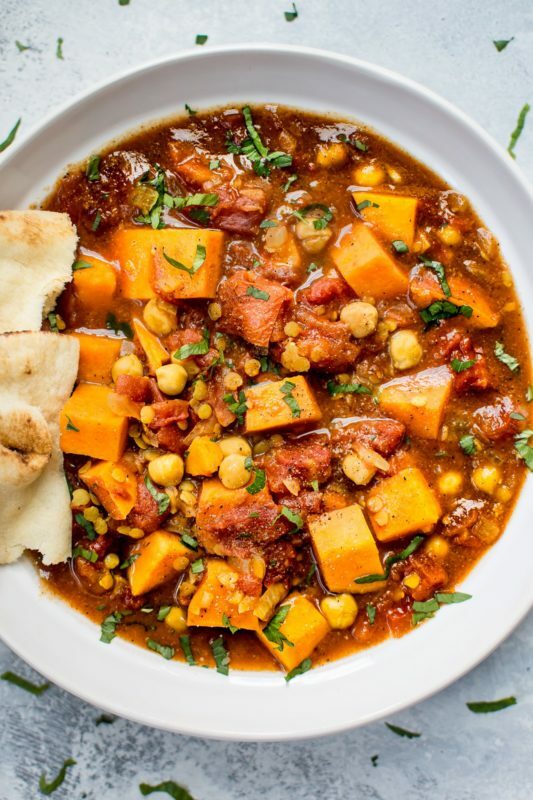 This stew is loaded with with good stuff including red lentils, chickpeas, oodles of sweet potatoes, and a vibrant blend of spices. This amazing stew comes from Salt & Lavender! I’m on a “No Sugar Added” kick right now and this recipe hit the spot! I’m not sure if you follow Pinch of Yum at all, but they are doing this “No Sugar Added” thing in January and it’s quite insightful on the what and how around No Sugar Added. My daughter loves applesauce, but I hate buying it for her because of all the added sugar. 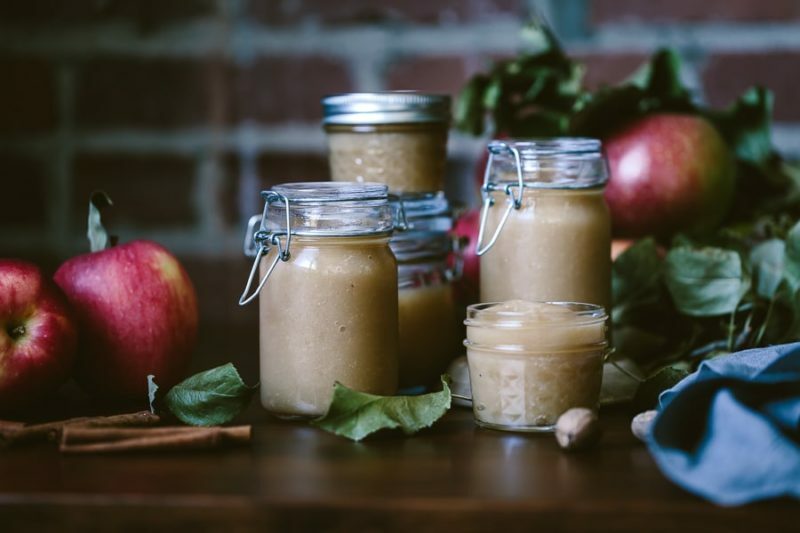 But thanks to Foolproof Living, I can now make my daughter a SUPER clean version of applesauce without worrying about any added sugar going into her system! And I hardly do any work! The slow cooker takes care of it for me! This is a gorgeous post and you’re going to love this one! I am all about soups and stews right now. It’s because it’s January and it’s cold outside. Well, if you call the high 60’s cold. I think January should officially be called the “Soup & Stew Month”. And this stew is a hearty one! 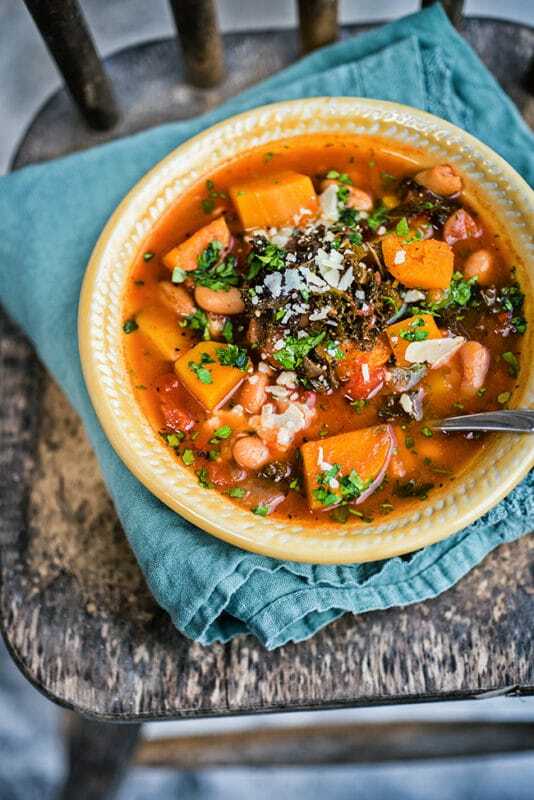 Squash, sweet potatoes, bean and kale…this is a POWERHOUSE stew! Don’t miss this treat from Supergolden Bakes. This is the most unique slow cooker vegan recipe I’ve ever seen and I love it! Who would have thought you could cook a whole head of cauliflower in the slow cooker? 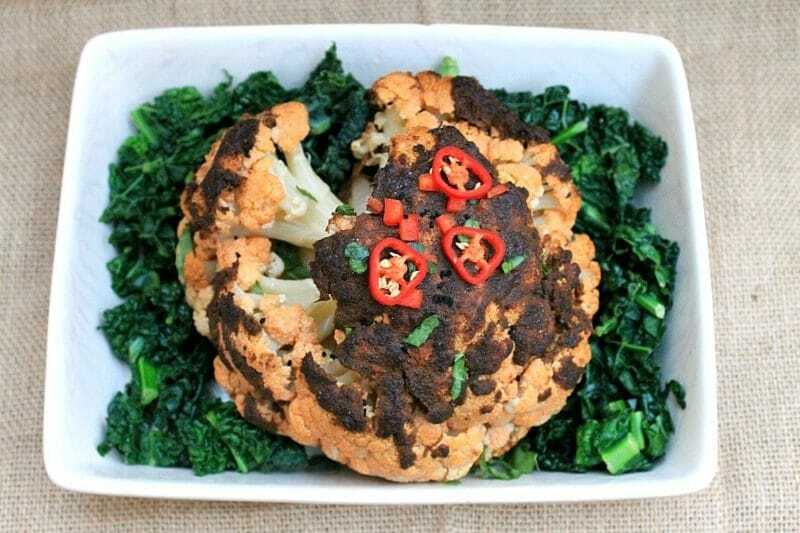 You’ve got 5 simple ingredients with this one…cauliflower, olive oil, curry powder, red chili and coriander. Yum! Check this one out from BakingQueen74! This one is a play on green chicken chili and is amazing in taste! 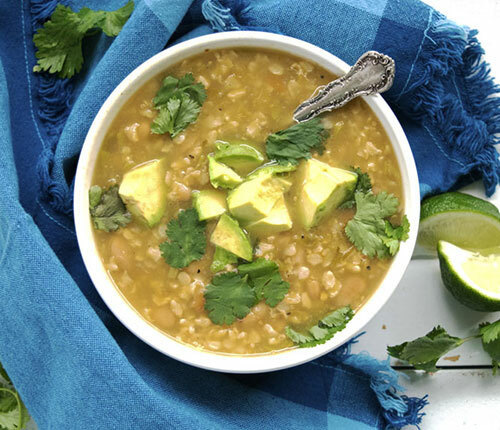 The white beans are creamy and the nutty brown rice makes this soup hearty. Check out The Hungry Waitress for this spin on a classic recipe! How gorgeous is this?! 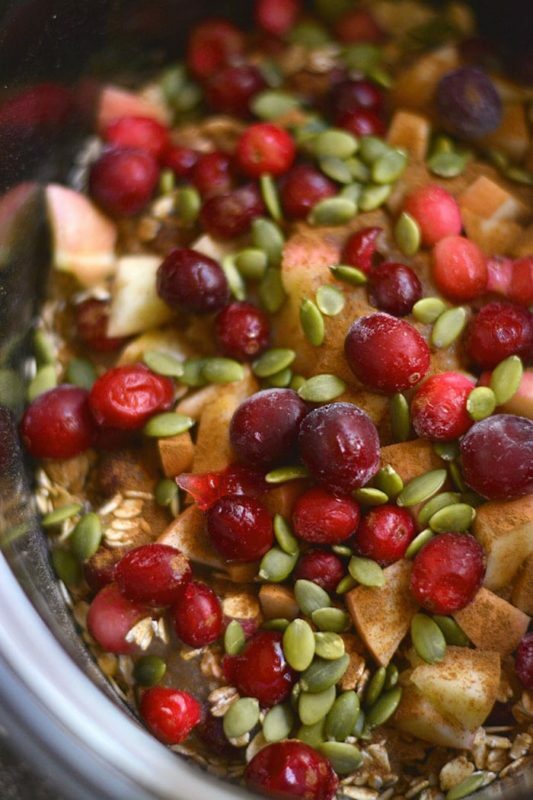 This Cranberry Apple Crockpot Oatmeal is a healthy oatmeal balanced with protein & healthy fats! This one is from Skinny Fitalicious and it’s Gluten Free and Low Calorie! Black beans are super high in fiber and protein and they go so perfectly is soups! 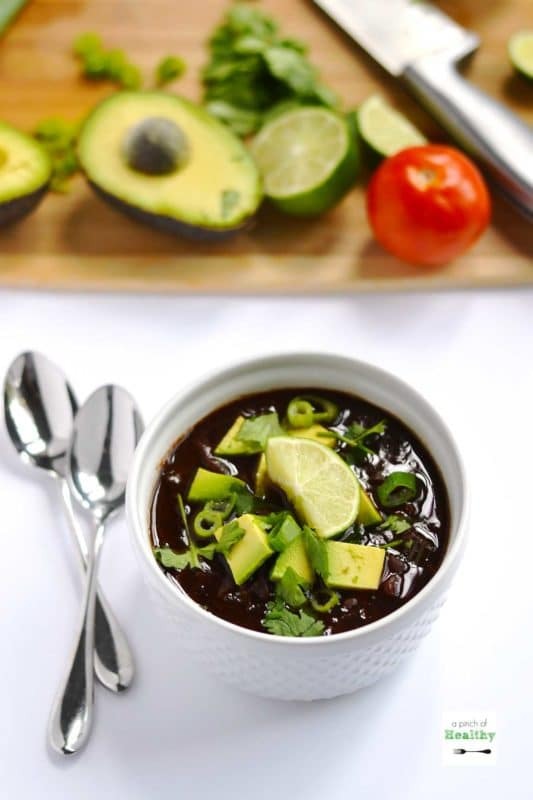 You just can’t beat a Black Bean soup and this version from a Pinch of Healthy is over the top good because it’s filled with a TON of fresh vegetables! We’re talking celery, red and green bell peppers and tomatoes! Top this one with fresh avocado! 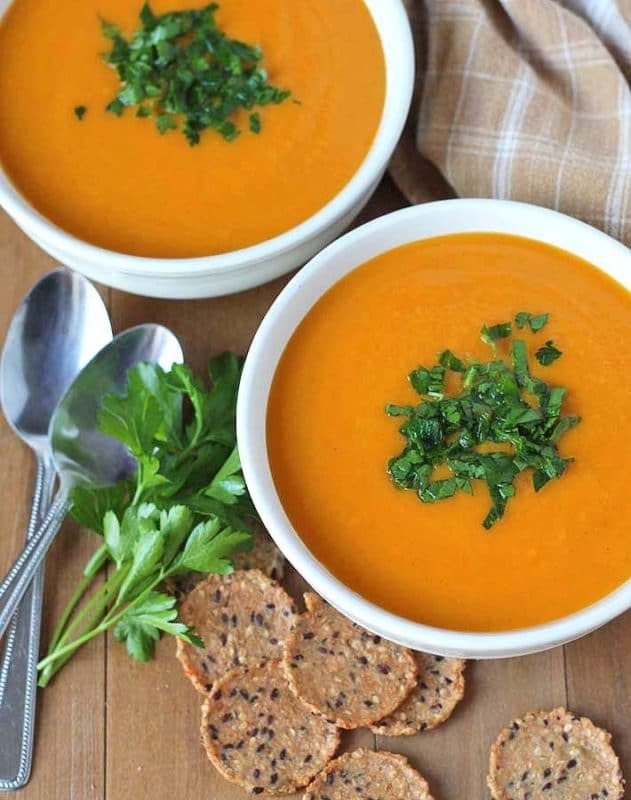 This soup is perfect to have on a cold winter’s day! Coconut milk is the secret to making this one creamy. You’re going to put the carrots, butternut squash and sweet potatoes in the slow cooker. When they’re done, you’ll puree until smooth! This one has velvety finish!! This yumminess comes to you from Delightful Adventures. And there you have it! Guys, your slow cooker is your ‘set it and forget it’ machine. Take back your time this year and that that slow cooker do all the work! Enjoy these my friends and happy 2018!! Make sure to pin this one on PINTEREST under your favorite SLOW COOKER and VEGAN boards! I hope you enjoy these! 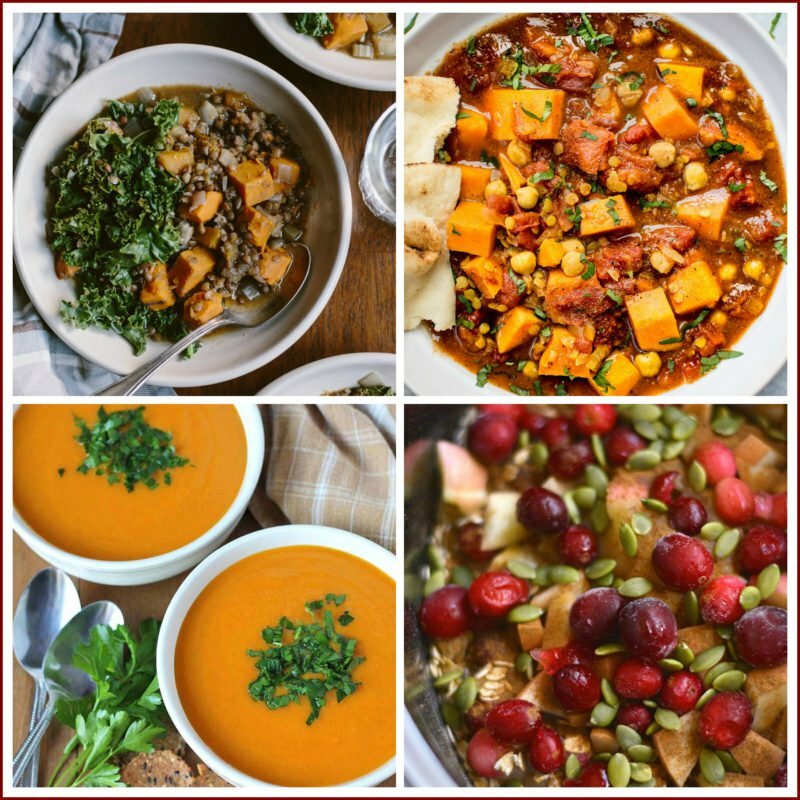 There are some FANTASTIC recipes in this roundup!! These all look fabulous! I can relate to your situation with family food allergies. My children and I can eat anything but my husband can’t have gluten, dairy or sugar. So finding yummy vegan meals that are slow cooker is always good news!